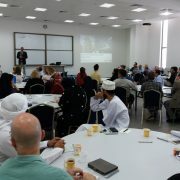 BARKA To welcome the new batch of students, the Orientation Days were held at the German University of Technology in Oman (GUtech). 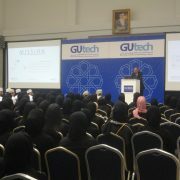 More than 500 students have started their studies at GUtech this week. The students were introduced to academic and student life on campus. The Rector of GUtech, Prof. Dr. Michael Modigell, welcomed the students in the morning. “GUtech’s goal is to educate students to become critical citizens, who are able and willing to contribute to the development of the country and the region,” said the Rector while adding: “You are the future of Oman. Being a good citizen is different than being a good engineer,” he said. In addition to the academic studies, the University fosters creative and critical thinking in order to advance research and development. Ruaa Al Hadhrami who went to Al Sahwa Schools will study BSc Computer Sciences. “I like technology, it is used in our everyday lives,” she said. Ruaa said that she heard from her friends about GUtech and that she is excited about the studies on campus. She wishes to study abroad one day. Ruaa’s school-friend, Arwa Al Hadabi, will study Environmental Engineering at GUtech. “Clean energy and our planet are important issues. I think much more can be done to protect our nature. Since I was young I have been interested in environmental issues,” she said. GUtech offers a Foundation Year and BEng programmes in Environmental Engineering, Mechanical Engineering, Process Engineering and BSc programmes in Computer Sciences, Applied Geosciences, Logistics, International Business and Service Management as well as in Urban Planning and Architectural Design. All academic programmes are internationally accredited and taught in English. BARKA The German University of Technology in Oman (GUtech) has launched its one week Professional Development Days for all academic and administrative employees. 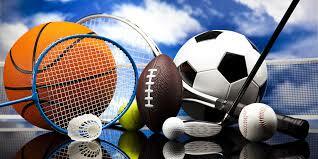 The week will include a variety of lectures on different aspects regarding teaching and administrative matters. The Professional Days were launched by an introduction to ‘Blended Learning’ which has been applied at GUtech in recent years through the Moodle system. Blended Learning includes any kind of mixture of teacher-centred knowledge transfer and self-paced media supported learning. It combines the virtual learning and a non-virtual learning environment. “The aim is to motivate students and to improve student-centred learning, while offering group learning opportunities for some and opportunities to learn individually for others. Therefore, the quality of teaching and the learning experience for the student will be enhanced,” said Prof. Dr. Heribert Nacken, Rectorate’s Delegate for Blended Learning and Exploratory Teaching Space at RWTH Aachen University, GUtech’s partner-university in Germany. The ultimate goal should be to educate creators and innovators instead of conformists. Therefore, the new teaching technologies including social media, which are familiar communication tools for the new generation should be applied on a regular basis in the classroom. For example mobile phones and tablets are integrated in lectures. “Blended learning needs to suit the teaching habit of the lecturer,” said Prof. Nacken while stressing that it should be highly encouraged but not enforced. At RWTH Aachen University the Center of Excellence in Academic Teaching supports the different faculties in realizing blended learning techniques in the classroom. RWTH Aachen faculties have introduced video teaching as an effective teaching tool, which is very popular among students. According to Prof. Nacken 60-70 % of the students watch the videos prior to the lecture. RWTH Aachen University is part of the Massive Open Online Courses which are held in cooperation with leading universities in Europe such as ETH Zurich (Switzerland). In addition, the RWTH Aachen app is applied to test the student knowledge anonymously in the classroom. The Phyphox App is used in Physics for experiments outside the classroom by using a mobile phone. At GUtech Blended Learning has been applied through the Moodle software. To improve the quality of teaching of all departments, it is planned to implement further methods.